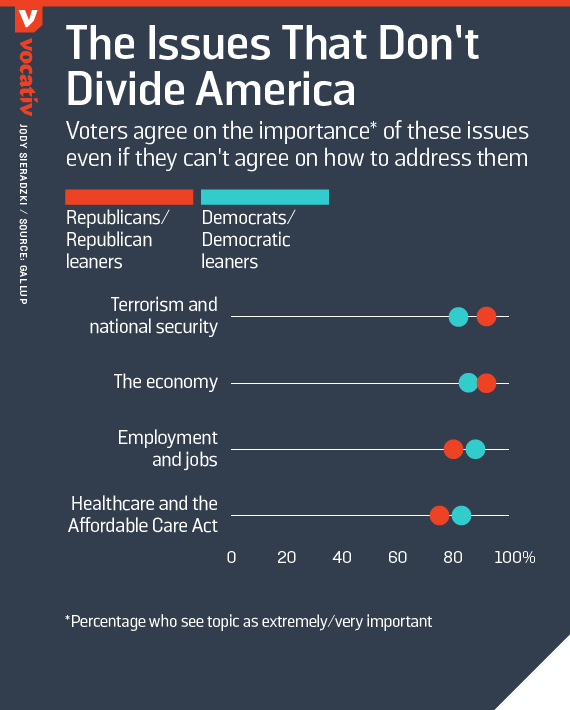 Republicans and Democrats agree that four main issues are of utmost importance in the 2016 presidential race -- even if they don't necessarily agree on how to address them. Voters in both parties view candidates' positions on terrorism, the economy, healthcare and jobs as extremely important in influencing who they'll choose for president, according to a Gallup poll released on Monday. Terrorism and national security as a single issue ranked as above average in importance for voters ahead of the February 1 Iowa Caucus, with 92 percent of Republicans and 82 percent of Democrats calling them extremely or very important in the campaigns, the poll found. With that sentiment prominent in the backdrop, GOP frontrunner Donald Trump has sought to position himself as someone who will be tough in fighting ISIS. He also called for a ban on Muslims entering the United States "until we can figure out what's going on," and has said that refugees from Syria are "probably ISIS." His primary rival in the polls, Democratic frontrunner Hillary Clinton, has emphasized her experience as Secretary of State in convincing voters she is most qualified to defeat the terror group. Her plan involves "a more effective coalition air campaign, with more allied planes, more strikes and a broader target set," she said in November. The economy is also critical for voters, ranking above average in importance to 92 Republicans and 85 Democrats, followed by jobs and employment. For 75 percent of Republicans and 83 percent of Democrats, healthcare and the Affordable Care Act were also labeled extremely important. Beyond those key issues, though, Gallup found that Democrats and Republicans are pretty much divided over everything else. Democrats were more likely to say they care more about education and distribution of wealth, while Republicans were more likely to count the federal budget deficit, foreign affairs, size of the government, immigration and taxes as more important in the election. Surprisingly, gun policy wasn't up there for either political party, even though it has become a central issue of the presidential campaign in the aftermath of several mass shootings. The post The Four Campaign Issues That Don't Divide America appeared first on Vocativ.